Archaeologists announced Tuesday that excavations for a Mexico City subway extension have turned up what appears to be an unusual Aztec offering: a dog's skull with holes that indicate it was displayed on a ritual skull rack normally reserved for human sacrifice victims. Excavators also found a woman's skull and two men's skulls with similar perforations around the temple, which allowed them to be mounted on a public display rack known as a tzompantli. The find dates to between 1350 and 1521 and is the first time a dog's skull has been found along with a skull rack, according to Mexico's National Institute of Anthropology and History. The skull racks usually displayed the severed heads of captured warriors from rival groups, who were sacrificed as an offering to the gods. Few of them have actually been excavated. "We know that during the conquest some horse skulls were placed on this type of structure, but not dogs," said institute archaeologist Maria de Jesus Sanchez, referring to an account documented by the Spanish conquerors who found the remains of captured colleagues as well as their horses displayed on a rack. Since the Aztecs didn't have horses, they may have taken the animals as sacred beasts, or something joined with the horse's rider. The Aztecs did have dogs, albeit smaller ones that seldom barked, so they would probably have known what they were putting on display. "Perhaps there are dogs associated with these altars in other sites and we don't know it," de Jesus said. One possible explanation might have been dogs' ritual importance in death or burial rites. According to some pre-Hispanic beliefs, a dog accompanied his owner in the underworld. 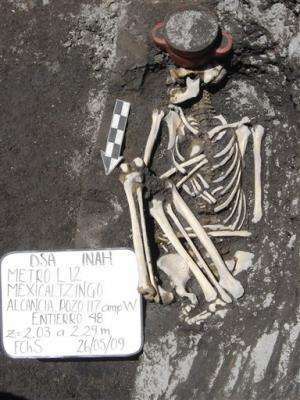 University of Florida archaeologist Susan Gillespie, who was not involved in the project, wrote in an email that the appearance of the female skull was also unusual. "What little information we have on the use of skull racks indicates that they were the resting place for the heads of war captives, and females generally were not taken in war," Gillespie wrote. The excavations were carried out as part of a 15-mile (24.5 kilometer) expansion of the city's subway station. They also uncovered about 100 burials, mostly of children. Doing some research on the Mayans. Anyone that can help please contact me by e-mail. My e-mail is chloeconner616@gmail.com. Thank you.